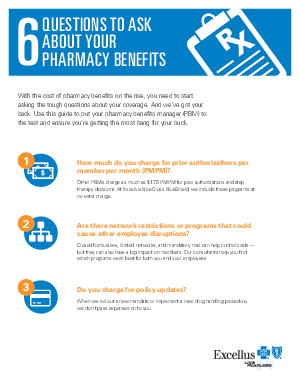 Do you know how much your pharmacy benefits really cost? If you haven’t talked through the details of your plan, you might be surprised. The cost of pharmacy benefits is on the rise. If you want to get the most value for your dollar, you need to know the right questions to ask your pharmacy benefits manager. Everything from prior authorization charges to network restrictions that can cause employee disruptions. Our six questions make it easy. Looking for more answers? Remember, Excellus BCBS is here to help. We are always here to answer your questions.